Recording Kite with a Drone? GWTW Forum > Kite Land Talk > Geek Speak > Recording Kite with a Drone? The next thing I want to try is recording from a drone. I would like to try using something other than a quadcopter if possible but I cannot find any for sale that are in my price range (looking to spend under $500 as I will use the drone for other photo shoots as well). I was thinking that with kites a quadcopter might mess up the wind too much which is why I want to avoid it, but I would not be upset about getting a Parrot Drone as they seem to be fairly non intrusive. Has anyone filmed kites with a drone before and can offer me some advice? Looking for any models to look at that might work better than a cheap parrot and just to get some input on the idea. Thanks in advance. Re: Recording Kite with a Drone? Yes! I've done it once, and will certainly do it again. It starts at about $500 and is tiny and really excellent all around. L'Atelier, a French kite company, did a promo vid for The Slash I think. Now, I'm not sure if they used a drone, or another kite for this. I watched the video and it seemed really good, you don't give yourself enough credit in the comments. Good shout on now flying somewhere busy, would hate to get a drone tangled in someones line. I'm going to take a look at the DJI Spark as well, it looks a little expensive compared to what I wanted to spend but not entirely out of budget. One of the things about inexpensive drones is they don't stay steady in the air without a lot of pilot interaction, especially on windy days. And as the cheap ones are controlled from you phone, the controls are hard to manage if the drone wants to wander around. Probably not a big factor for SUL flying, but would make shooting in real wind more difficult. The Spark is one of the only really small drones that has good high wind manners and even though the cheap version is controlled from the phone, this makes it a good choice for kite videos. Many years ago I used KAP to get good photos from the sky. For the past 3 years or so, I've been using a drone. 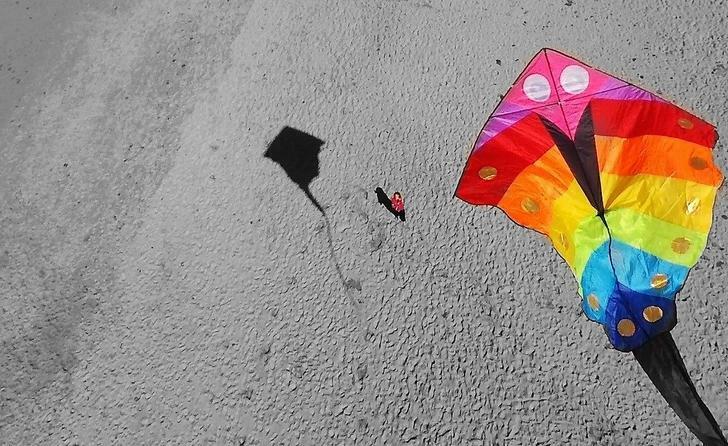 You can get great photos of kites using a drone... .but it's tricky. Propellers do not like kite line. Also, kites don't always stay in one fixed place. When you have $1200 into a drone, and perhaps $500 into a kite... you don't want to play "lets see how close I can get". Because of kite lines you need to maintain a good distance from the area the kite is in. if you are around a lot of kites, you need to know _exactly_ where the drone is and where it is going. I was out yesterday getting some shots of 2 SLK that I had in the air. I was up above the kites but then lost track a little of where the drone was. i needed to fly up and then way around the kite field before I could lower the drone. The most impressive drone shots of kites is when the drone gets close enough to the kite to fill the frame with the kite. Since drones don't really have optical zoom and also since they tend to have a wide angle lens, you'd need to be really close to the kite. Those are things to consider but I LOVE filming kites with my drones. You can can some really great shots... and those are shots you could not get otherwise. Those are some pretty amazing shots. What drone/drones did you use for them? I'm currently using a Phantom 3, Phantom 4 and Mavic Pro. All of the photos were taken with the Mavic. Personally, I like the photos from the Phantom 4 better but the Mavic is the "newest" so I always seem to gravitate toward it. Same seems to apply to kites as well. The Mavic is so compact and quick. I would definitely recommend a second hand drone to start with. If you don't like it you can probably sell it for the same price again on Ebay afterwards. If you want to take still photos from video footage get a drone that records in 1080 or 4k to get decent stills from the video.